I read The Widow of the South several years ago and I’ve been looking forward to visiting Carnton (the setting of the novel) ever since. Carnton Plantation was built in 1826 by Randal McGavock. He was the mayor of Nashville for one year in 1824 and was buddies with Andrew Jackson. The one thing you find over and over as you learn the history of Nashville is that EVERYONE seems to have some connection to our 7th President! By the time of the Civil War, the house belonged to Randal’s son, John, and John’s wife, Carrie. Carrie McGavock and Carnton had a dramatic part in the story of the Battle of Franklin. Located less than a mile from the battlefield, Carnton became a temporary field hospital in November 1864. Over 300 wounded soldiers were tended at the home. 150 died the first night and 4 confederate generals were laid out on Carnton’s back porch. Carrie McGavock donated food and supplies to the cause and acted as a nurse for the wounded and dying soldiers. There are lots of stories about Carrie McGavock and Carnton. Plan a visit to tour this beautiful place and get the true stories from the guides who work at the Battle of Franklin Trust. When you enter the property, there is ample parking and plenty of good signage to lead you. The first building you will enter is the gift shop where you can purchase tour tickets. There is also a public bathroom located there. Tours are given throughout the day. If you arrive between tours, the employees will let you know what time to meet in front of the home. There is plenty to explore outside while you wait! The house tour will take about an hour and give yourself another hour to explore the grounds, out buildings and cemetary. There is no photography allowed inside the house but trust me, you will be way too interested in the stories you will hear on the tour to worry about your camera. The house tour does include the basement and a 2nd level that are not wheelchair or stroller accessible. There is a companion book available with pictures of those areas for those unable to climb stairs. Outside the main house, there are gardens and buildings to explore. Don’t miss a chance to walk around the gorgeous garden. And spend some time at the ‘witness tree’. This tree has been on the property since the Civil War. The McGavock family donated 2 acres of their property to be used as a burial place for the Confederate soldiers who dies at the Battle of Franklin. The story of how this cemetary came into existence is very interesting and your tour guide will give you all the details. The graves are arranged by regiment so it’s a great visual representation of the different places that made up the Confederate army. If you have very young kids, I would probably wait to take them on this tour. It is a Civil War site and some of the stories are not for the squeamish. I took my teens and late elementary age kids and they loved it. This tour would also be a great choice for out of town guests. 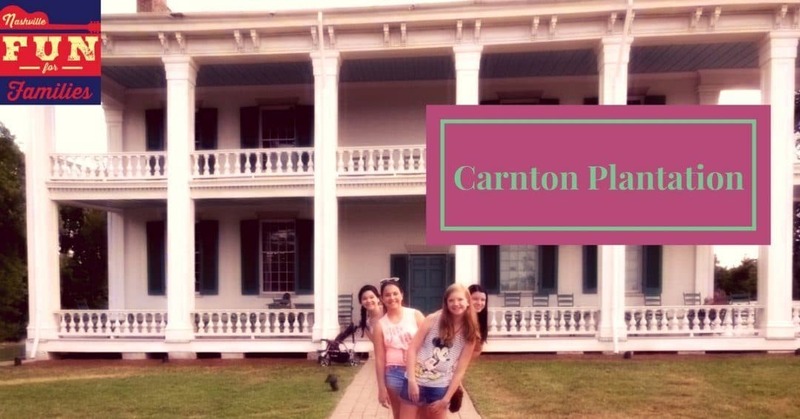 Carnton Plantation and The Carter House are located about 1 mile from each other and combo tours are offered. Specialty tours are also given at different times. These include a battlefield tour, a behind the scenes tour and extended tours of Carnton and The Carter House.